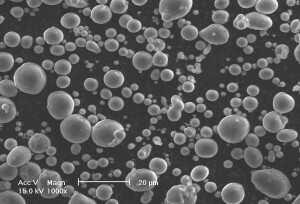 The Aluminium Powder Company (AMG Alpoco UK), based in Sutton Coldfield, UK, supplies high purity aluminium powder, granules and needles to a global market. Their products are used in a wide variety of applications including paints and pigments, coatings, propulsion and explosives, specialist chemicals and refractories. AMG Alpoco UK is a subsidiary of AMG Superalloys UK. AMG Alpoco UK is now moving into the aluminium alloys market with a range of applications in powder metallurgy and thermal spraying. The company is also working on converting aluminium alloy powders into consolidated materials – the fine grain size possible with powder-sourced materials gives advantages over wrought products in terms of the mechanical properties. Our Materials Development team has been supporting AMG Alpoco throughout their product development projects with expertise in materials characterisation and analysis. At Innoval we have extensive in-house characterisation and analysis capabilities which assist clients with their product development projects. We also help clients get to the root cause of any material problems. To give the very best value for money, we use our product expertise and knowledge of end-use applications to interpret test results and provide our cleints with sound, impartial recommendations, rather than just data. Throughout these developments Innoval Technology has been an invaluable partner, contributing their expertise in materials analysis and characterisation. I have been very happy with the technical contributions and the speed of response from them throughout the project.